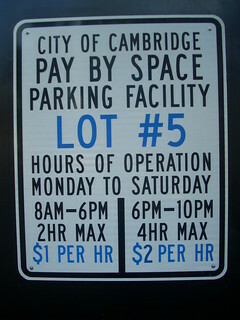 As of August 6, 2014, the City of Cambridge has doubled evening parking rates in Central Square (C2). With an ever increasing demand for parking in the Square, and the City considering the sale or development of municipal surface parking lots in the area, parking will only get tighter in an area already strained when it comes to public parking. While no one can argue the benefits of “less cars”, and more “housing, biking and public transit”, you do have to question the rapid pace at which it is happening in C2. Local retail shops, restaurants, nightclubs and bars rely on evening business and will be affected by the higher rates, not to mention the new HMart which is adjacent to two of these parking lots. The question is…will patrons currently driving to the Square choose to pay the higher costs, use alternate transportation, or simply go elsewhere? Some are asking if C2 businesses are being asked to do too much with too little. According to the C2K2 report (pg. 44), C2 has 1,281 public parking spaces, less than half of the available spaces in Kendall (2,755 spaces) and almost a third less than Harvard Square (1,741 spaces). 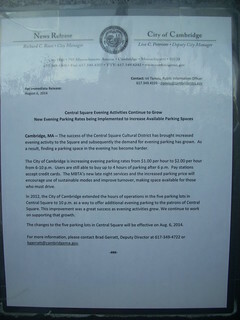 Unlike Harvard or Kendall, many of C2’s public parking spaces are owned and operated by the City, and with the City currently discussing the redevelopment or sale of several surface parking lots, public parking could dwindle even further. This all begs the question as to what the status is on a new, centralized parking garage or the redevelopment and redesign of the Green St. garage as recommended by the C2K2 report (pg. 13). The Cambridge Community Development Department‘s report (pg. 16) concerning the progress of non-zoning recommendations has scheduled the reconstruction of the garage as “long term”, and somehow managed to add the option of “tearing it down to accommodate other uses”, despite this option not being recommended in the C2K2 report. The definition of long-term is anyone’s guess. 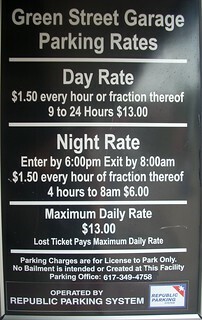 Metered parking on the street is still $1/hour and the Green St. garage is still at $1.50/hour; however this may change in the near future. At $2/ hour, Central Square now has some of the most expensive metered parking in the City, even Newbury St. is cheaper at $1.25/hour.